When asked to imagine a farmer, many people will describe an old white man, probably with buck teeth, fashionably working a straw hat that’s seen better days. While I feel awful to shatter this long held stereotype for the younger generation, it is something that needs to be done. Here’s why. I’m a farmer. Everyone who hears me say this takes a second to look me up and down, and then dismisses what I’ve said as a weird joke. Apparently being a farmer means I have to wear coveralls 24/7 and speak with some sort of slur. But this is obviously not accurate; farmers can look however they want to. They can be of different ethnicities, races and genders, and they don’t all come from the south and mid-west. There’s no official rule about what a farmer should be. But having cleared that up, I believe there’s a bigger problem at hand: it’s not just the farmers, but the farming. Just as there are stereotypes of farmers, there are also a lot of misconceptions about what farming really is and what it involves. You may have heard about “factory farming” (I’ll talk about that later), and you may have heard about “conventional farming.” But I believe one of the most misunderstood kind of farming is organic farming. I hope this article can clear up misconceptions and myths about organic farming and explain the positive effect that it has on people, while also discussing the deeper problems of our food industry. What is organic farming? This seems like a good place to start. Generally organic farming (or O.F) is a type of farming in which the use of chemicals is banned. What many people don’t know is that O.F is a relatively new term. There was no such thing in the 1940’s when my dad’s dad was doing it. The notion was born from what was left after the chemical industry took over many of the farms post World War II. Since then, chemicals have integrated their way into farming techniques through the use of pesticides (substances that kill pests), and chemical fertilizers (made from non-renewable resources, like fossil fuels). 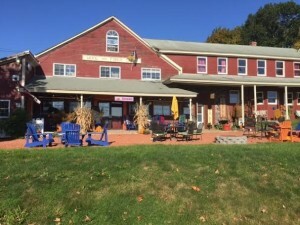 When I surveyed the interns who work at Nezinscot Farm Store, an organic dairy/ farm store in Turner, Maine, and asked them what organic farming meant to them, I was told, “something unadulterated” and “something done in an environmentally conscious way for the health benefit of the consumer.” But organic farming goes much further than just not using chemicals. The treatment of animals is definitely more humane (as opposed to factory farming, where animals are usually confined indoors and kept under harsh conditions). Organic farming takes pollutants out of the air by being able to trap carbon in the soil and store it there. Organic food is better for the body because it was never exposed to chemicals in the first place, and it doesn’t contain GMO’s (genetically modified organisms) which cause immune damage and can transfer the genes of that product into the bacteria in your body. Organic farming is also sustainable because it observes the ecosystem and moves along with it in order to prevent ecological imbalance, which would lead to things like pest problems. So in short, the farmers don’t destroy the soil fertility, and therefore are able to thrive off an area for a long period of time. In order to properly relay how important O.F is, I must also introduce the other side of the agriculture industry, conventional farming (C.F). This is the type of farming that does allow chemicals to be used in food production and animal care. The problem with having chemicals involved in a system of food production is the lasting effects they can have. As of now there is an ‘okay’ limit for how much of the pesticide can be left on the food being sold called MRL (Maximum Residue Limit), and in my view, that is outrageous! In a study done by the Board on Agriculture, Environmental studies and Toxicology, it was concluded that young children are susceptible to the effects of these chemicals and that they are associated with the growth of tumors and certain types of cancer. Chemical fertilizers, containing no organic material, which has binding properties, when in contact with bodies of water through run-off, cause ‘dead zones’. These are places where the chemicals in the fertilizer has killed the microorganisms in an area and depletes the oxygen levels so the conditions are unsuitable for any life form. This may start in a stream, but it ends up spreading to rivers, lakes and the ocean. This is bad because bodies of water are helpful in pulling toxins out of the air, and if the water is ‘dead’, it can’t do that. After knowing this, you may begin to wonder why conventional farming continues to be so prevalent in our country today. The sad truth is that they’re aren’t enough organic farms to sustain the demand for food as of now. Which brings me to my next point of regional food security (R.F.S). This is the ideal that there are enough farms every few miles to support a community. This would end the need for industrial farming and as the name suggests, provide a security for the country that just can’t be promised by conventional farms. R.F.S is really important and should be introduced on a grand scale, people would be healthier and there would be less of a “what if” factor when considering industrial farming. I have to admit, my strongly held beliefs are shaped by my personal experience; I was born and raised on an organic dairy farm. There is much to be learned from being brought up in a farming community. From a young age, you’re thrust into the responsibility of taking care of other life forms, whether it be goats or a garden. This taught me the importance of knowing what was happening to my food, and appreciating that I did know at the time. Knowing that, when it was time to process chickens, before each one the butcher would say, “thank you for your life.” I can’t promise you that’s happening in factory farms. Knowing that the lettuce on my sandwich was planted, grown and harvested right in my backyard, is something I wish I hadn’t taken for granted. Of course, a few years ago I had no idea it was such a big deal, I rolled my eyes when told to do afternoon chores as you would when told to take the garbage out. I’m not perfect; not everything I eat is purely organic. I admit I’ve had oreos. (I love oreos.) I’m just saying that I would give up all the oreos if it meant knowing where my food came from on a grand scale, and knowing that it won’t hurt me from the inside out. I write this with college students in mind because if they are known for anything, it’s complaining about lack of sleep and caring passionately about what’s around them. This is the age at which we try changing things, try saving the world. So, here is one of the best causes to put our energy into. Eating food that is organically grown is a change that is reasonable and necessary, and it will make the world better. I know it’s going to take some time to do it, but “the journey of a thousand miles begins with a single step.” Starting small is probably the most realistic advice I can give you. Start choosing organic, maybe buy a few products here and there. Support local farms, especially here in Massachusetts. Convince your parents to try it as well, because you’re in college and you’re broke, trust me, I know. Maybe later on, you could try an internship at a farm– it could be a life-changing experience. I have met the most interesting people being in a farming community. I’ve met a dancer from New York City; a woman who hula hoops at fairs (the hula hoop is usually on fire); a singer in a band, who taught me to play guitar; a man who is currently traveling the world; a man who builds earthquake-proof schools for people in Nepal, who enhanced my love for literature. In other words, I have met some of the most culturally diverse and amazing people thanks to my family’s farm. While this article may seem like the rantings of a teenager who was born and raised with these ideas neatly set up for her by her parents, I can tell you with the utmost certainty that organic farming matters. It matters to our own well-being, and to the well-being of our planet. If we do not change things, and change them soon, we’re risking the health of our bodies, and the health of our world.